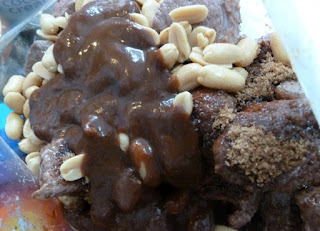 Jejune's Place: Freezer Meals - Obsessed? Who me? 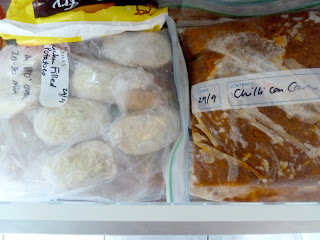 Freezer Meals - Obsessed? Who me? I'm in the midst of a short stint as a magazine editor, and by the end of the day working in an office, and all the driving, I'm completely worn out — all I want to do when I get home is collapse into a chair with my knitting, in front of the telly. But there is this distressing need to ingest food every single night (can you believe it?! ), and a family of four to feed, with — ideally — nutritious meals. I quickly discovered that I couldn't afford a Jeeves, and the realities of a family consumed by chronic illness means They are often too unwell to help in the kitchen ... so I decided to give the recent 'fad' for 'cooking in advance and freezing' a try. This has made such a difference to us! Last weekend I chose eight dishes to make in double or triple quantities. Admittedly, buying all the groceries and then cooking it all is quite a feat — it took me all day, and was possibly a tad over the top. It would have been sensibler to have started with four or five dishes, not eight. It is so delightfully easy to come home and just defrost something, or for someone else in the family to put the contents of a packet into the slow cooker, and turn it on. 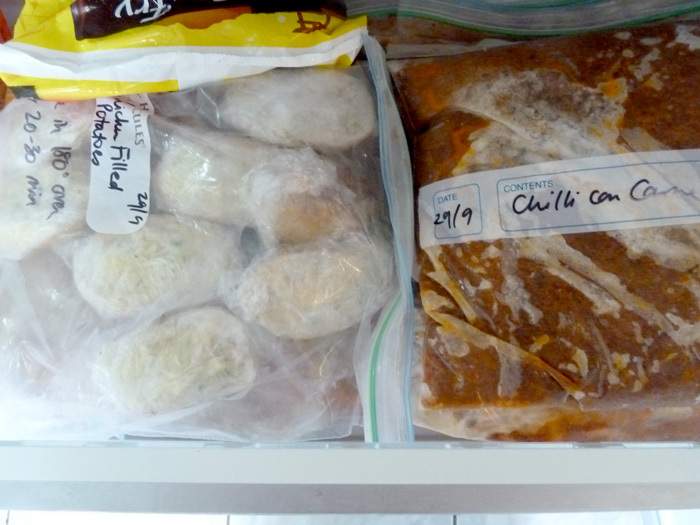 This weekend I've made a couple more dishes to restock the freezer, but I've actually run out of room in the freezer. Ooopsies. I am seriously considering getting a small chest freezer to accommodate more meals. You don't have to put all the groceries away when you get home, if you just start cooking with them right away. Make a day of it! You can buy in bulk if you want, which reduces your cost per meal. You've got all your cooking gear out, which makes it easier to do multiple meals at once. You're making double or triple batches of each dish, so one lot of prep leads to two or three meals. You can lug out the food processor to chop veggies en masse (rather than wielding your knife or grater). Yes, there's a lot of washing up, but it means you have minimal washing up during the week. Look for family favourite recipes that can be frozen, and either fully cook them, or partially prepare them. Avoid anything too heavily creamy (or put instructions on the bag about what dairy etc to add on thawing). 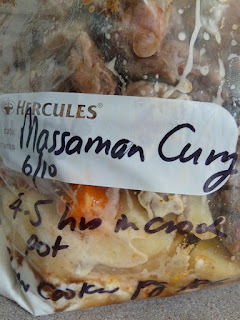 Fling the ingredients for a stew, soup, or curry into the bag, ready to cook (see pic above, of Massaman Curry in a bag). I like to fry the meat first, but all the other ingredients can just be tossed into the bag, without mixing. Label large ziplock bags with the name of the meal, the date, and instructions on how to finish cooking, and/or the recipe book it's from. Put a baking tray into your freezer, as a flat surface for the bags to lie on as they freeze. Do a large batch of meals to start with, and then top up with a few meals cooked on weekends after that, to replenish what you use during the week. I used to do a weekly menu plan, of seven dishes, and buy everything for those dishes, but found it a massive amount of planning, which I often avoided, plus I still had to make each dish after a full work day. This is so much easier, as you only have to choose a few dishes at a time! These are the meals I've made so far. Get inspiration from your crock pot cookbooks, and there are a bunch of other resources, a lot of other bloggers have recipes and tricks and tips. I've pinned links to some on my Pinterest Food and Drink board. Yay Nisi, Way to think ahead and make good plans! the slow cooker is our friend. One of my clients said to me, "You work all day and then go home and cook dinner?!" I'm not sure who she thought was going to do it if I didn't! I make good use of the crockpot and when I cook something for dinner, I just cook a lot of it and freeze the leftovers for another night. I am so grateful for the freezer. Are you enjoying the magazine gig? I always cook more than is needed and freeze it. When I feel poorly I have ready made dinner. I think your military operation is to be admired and aspired to!! !